“Say it right +” is a series of episodes on English Club TV with a twist. Created for students looking to improve English, the TV show puts a medical spin on treating Language Germs. 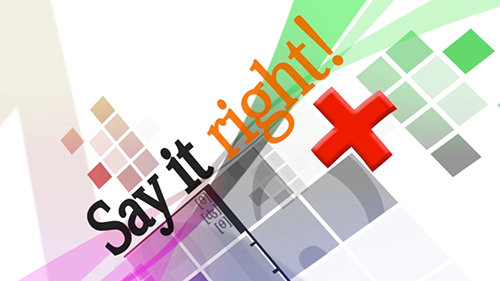 Much like patients go to the emergency room for the treatment of illness, viewers can turn to “Say It Right+” for the treatment of all their language-related illnesses. Hosted by a native speaker, each episode focuses on common misnomers in the English language. The host uses clear, concise English to analyze and explain various confusing English terms. Each episode ends with the summary of the materials discussed during the episode where the host recaps the lesson. The medical concept of the show, as well as the host’s portrayal of a nurse, makes the show fun and engaging for viewers. “Stationary” vs. “stationery”, “except” vs. “accept”. Where the phrase “wannabe” came from? Is it true that each human is humane? Why some people can be called “sacred cows”? What is your perspective on your prospective English studying? How sensitive personnel can react to sensible personal commands? How can you make crocodiles cry? Why horrible is worse than horrific? How to change your English with one quick switch?